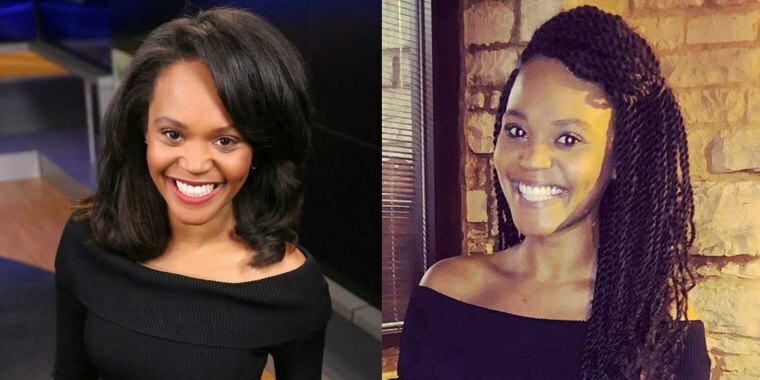 After previously facing criticism for her natural hair, a former news anchor in Jackson, Mississippi, is speaking out about being fired from her local news station last year. Brittany Noble Jones started working for WJTV in late 2015 and, like many newscasters, the journalist had a signature on-air hairstyle. After rocking a chic "anchor bob" in college, Noble Jones switched up her look to avoid damaging her natural hair. "Once I got into the industry, I realized I was burning my hair off by straightening it every day to achieve the 'anchor bob' look, so I decided to wear a 'sew-in.' I could braid my hair and sew fake hair extensions on my head," Noble Jones told TODAY Style. After wearing sew-ins and wigs for several years, the journalist's hair texture began to change and she wasn't sure how to style it. So, rather than denying her natural texture, Noble Jones decided to embrace it while pregnant with her first child. "When I was pregnant, I wondered how I would teach my child to love their hair and I didn’t love my own. I asked my news director if I could stop straightening it because I felt like my audience could relate to my authenticity," she said. The newscaster began rocking her natural locks in March 2017, but after only a month, her news director asked her to change her hairstyle back to her previous look because it was "unprofessional." "I wasn’t surprised that my ND wanted me to change my hair 'back to the way it was because that’s what looked best.' He hired me with the fake hair. I’m sure he didn’t know what I went through every day to achieve the style, but I knew what I was getting into when I signed a contract with WJTV. TV news contracts are similar no matter where you work," she said. In the month that she had sported her natural hairstyle on air, Noble Jones never received hate mail about her look, but her boss told her he had received negative feedback on her hairstyle. By June 2015, and Noble Jones found herself filing a corporate complaint. Soon afterward, Noble Jones told TODAY she experienced ongoing harassment at work. "After filing the first complaint, the corporate HR department would say to me, 'Where are your curls? You said you wanted to wear your curls.' Management couldn’t understand that the black hair texture is very different from what they know," she said. "I have been going through great lengths since I was a little girl to 'tame my fro,' but how would people know that?" Soon after she filed my first complaint, Nexstar informed Noble of the company policy stating that on-air talent could not have “shaggy, unkempt” hair. She again started wearing wigs on a daily basis until she ran out of time on one busy morning. As a compromise, the anchor braided her fro into a chic bun, but was disappointed when she later had to undergo several performance reviews following this incident. In March of 2018, Noble Jones filed her second complaint with Nexstar and, soon after, filed a case with the Equal Employment Opportunity Commission. In May, Noble was unexpectedly terminated from WJTV while she was caring for her dying grandfather. A spokesperson from WJTV-TV and Nexstar Broadcasting told TODAY Style they stand by their decision to terminate Noble: "WJTV-TV and Nexstar Broadcasting, Inc. maintain a strict zero-tolerance policy which prohibits harassment, discrimination or retaliation of any type. Allegations that Ms. Jones’ employment was terminated for her choice of hairstyles have no basis in fact and are vigorously denied. Ms. Jones’ employment was in fact terminated for excessive absenteeism and for her failure to return to work and fulfill her contractual responsibilities after exhausting all available leave time." As Noble Jones awaits news on her EEOC case, she said she hopes that her story helps spark change in the industry. "I hope that corporations will take a look at their policies and handbooks. I want to help news organizations diversify their product because America is counting on us. Our newsrooms should reflect the community we serve," she said. "We’ve got to find ways to work together. My story is so much bigger than hair."